What is Ear Reshaping or Prominent ear correction (Pinnaplasty or Otoplasty)? Prominent ears are a very common problem in UK, affecting as many as 2 in 100 people and its psychological impact can be very profound among men. This sort of aesthetic problem can have a real effect on self-esteem, particularly in social situations as prominent ears can be focus for ridicule. Ear correction or reduction surgery or Otoplasty surgery is to resculpt and reshape the ear, is a simple operation which can be performed on most adults. 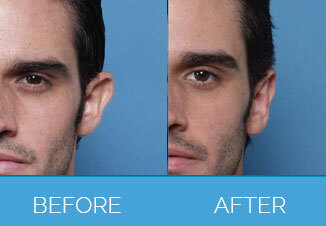 The surgery is used to correct prominent ears as well as enlarged or deformed ear lobes. However, it is very difficult to achieve symmetry between the two sides and minor difference can occur. In these circumstances, the surgeons that Nu Cosmetic Clinic refer you to may offer a re-operation if required. There are no patient stories for Male Ear Reshaping Surgery.